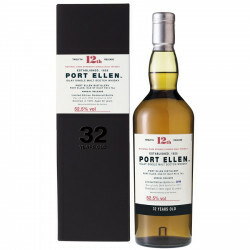 Port Ellen 32 Years Old has all the characteristics of a complex and elegant whisky with a long maturation and features the typical smoky style of the distillery. Rediscover the legendary Single Malt of Port Ellen distillery, closed nowadays, in a limited cask strength edition, matured for 32 years in American and European oak casks filled in 1979. Very clean and fresh for its age, Port Ellen 32 Years Old presents all the characteristics of a complex and elegant whisky of long maturation and features the typical smoky style of the distillery. In 1824, the Port Ellen distillery was built on the Isle of Islay, Scotland. Purchased by John Ramsay in 1836, it was the first distillery to export its Single Malt to the United States. At the cutting edge of technology, Port Ellen is the first distillery that used a spirit safe for distilling. The story of the distillery is complicated, and has alternate periods of closure and production from 1930 to &969. In 1973, it becomes in 1973 a malting house supplying all the island distilleries with smoky malted barley. In 1983, the distillery closes and the spirit production stops. Its salty, smoky spirit has become one of the most sought-after malt by collectors, investors and aficionados. Colour: dark gold, with bronze highlights. Quite oily. Nose: smoke rises from the glass, but also soft and creamy notes of honey and cereals. Through the foggy smoke, sweet aromas evoke citrus and candy. Palate: amazing and original, balances between soft and tangy. The soft smoke evolves into bitter dark chocolate. With a few drops of water, the whisky becomes more maritime and slightly salty. Finish: rather thick, with soft, silky tannins shadowed by distant clouds of smoke.